Set in July 2005, a series of mysterious murders took in Tokyo, Japan where all the victims were female and killed by external injury. On July 21st the, the 31st victim was found. The police force classified the case as special crime #568 and began to seek investigators from occult sources. The story begins on July 23, with the 32nd victim where Koutarou Kuga and several others set out to investigate. Shikigami no Shiro (English: Castle of Shikigami) is a shooting game series developed by Alfa System and was released for multiple consoles. The EX version is a Windows port for the first Xbox game, released on August 2002 by Sourcenext with few upgrades. The most prominent of the EX version is Internet Ranking Mode or I.R Mode, an arranged mode with higher difficulties, but under extreme mode and designed to online scoring. The second feature is vertical screen layout from the arcade game. 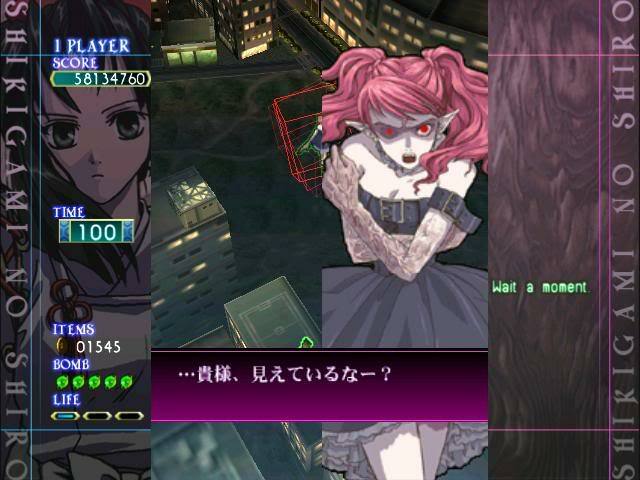 Shikigami no Shiro is similar to Cave’s Epsgaluda or ESP Ra.De, where player control human characters who fly through the skies with 3D landscapes. There are six characters, each with different powers and storyline. Player must battle through five stages, each consisting of two or three sub-stages each with a boss is fought at the end of each stage. The game require player to play through a game as single character and forbidding from switching after dying. There are three main types of attacks: normal shot, special and Shikigami. Normal shot is a standard fire and executed by tap attack button. This basic attack can be increased its power up to four levels. Special is a spiritual attack to bombard enemies. Each character has a different bomb style, but player is invulnerable when the attack is in effect. Shikigami is a temporary slow mode in which player gather all existing items on the screen. Shikigami executed by holding attack button for over 0.3 second. The scoring is based on Tension Bonus System (TBS). In Shikigami no Shiro destroyed enemies will release coins for free and have to be gathered by player. Whenever player closer to danger (enemies and bullets), they will receive higher multiplier which is ranges from 2x to 8x for both score and the number of coins. Destroying an enemy with the shikigami attack causes all coins released by that enemy to by auto-gathered immediately.